Dinner for $3 a person is much easier, I think, than it seemed like it would be. I may be resting on my laurels a bit, since we’re not quite done with the 3-for-$3 challenge week, but I haven’t felt at all stressed or deprived by cooking and eating this way, and neither (to my knowledge) have J. and the boys. Since I haven’t been posting for the past few days, I’ll give you two out of the three $3 a head dinners tonight; I’m also feeling a little guilty about my absence, which was motivated purely by me feeling like I needed to prioritize some other things, so I’m offering a BONUS recipe. A few days ago, I was eyeballing all the apples on my kitchen counter — I cannot resist buying up big totes of freshly picked apples at the farmer’s market during this time of the year — and also contemplating half a loaf of slightly stale crusty whole-wheat sourdough bread. I knew I had to use that bread, or else feel bad about it, and I was itching for a new experiment. Somehow, in the back of my mind, an idea slowly formed. It crept up on me so subtly that I was actually right in the middle of folding a load of laundry when a voice in my brain spoke up sharply: “Wouldn’t it be great if French Toast were PORTABLE?” And thus was conceived the idea for something that was LIKE French Toast, but could be held in the hand, wouldn’t be too messy, and could do grab-and-go breakfast duty like a champ. In other words, a French Toast Muffin. Now, to the $3 dinners. On Tuesday night, my harried choral rehearsal night, I turned to my Mom’s old spaghetti and meat sauce recipe, which I’ve adapted to be slow-cooker friendly. It needs nothing more than a green salad, and maybe some garlic bread, to be one of those meals that takes me right back to childhood. Luckily, it’s also frugal and filling and tasty. Yes, slightly over at first glance, but the sauce made more than was needed for the pasta, so that’s a savings, and there were leftovers anyway. If I adjust the cost down by 2 servings, this is well within the $3-per-person range. 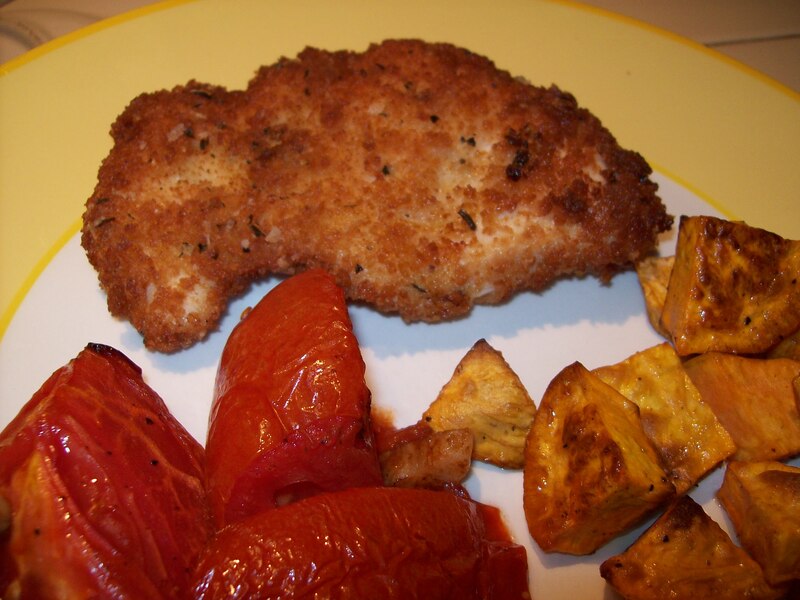 Tonight’s dinner of Chicken Cutlets, served with quickly roasted tomatoes and sweet potatoes, was a family favorite. Although I usually don’t pan-fry much of anything, there is occasionally just that yearning for the super-crispy, succulent coating that comes with letting some well-breaded chicken hang out in hot olive oil. These are so quick, too, since I pound pieces of boneless chicken to be nice and thin before breading and frying — it takes only about 5 minutes total to fully cook each piece of chicken and seal its moisture within the crunchy outer coating. There wasn’t much talking during dinner tonight, what with all the full mouths! Before I wrap up tonight, I want to invite everyone to please “like” the new Red, Round, or Green Facebook page by clicking the button to the right! I’m offering a tip of the day, plus daily lunchbox menus and other tidbits, to the Facebook community — but you can’t see the awesomeness unless you join. (I know, I’m both subtle and modest.) See you there! 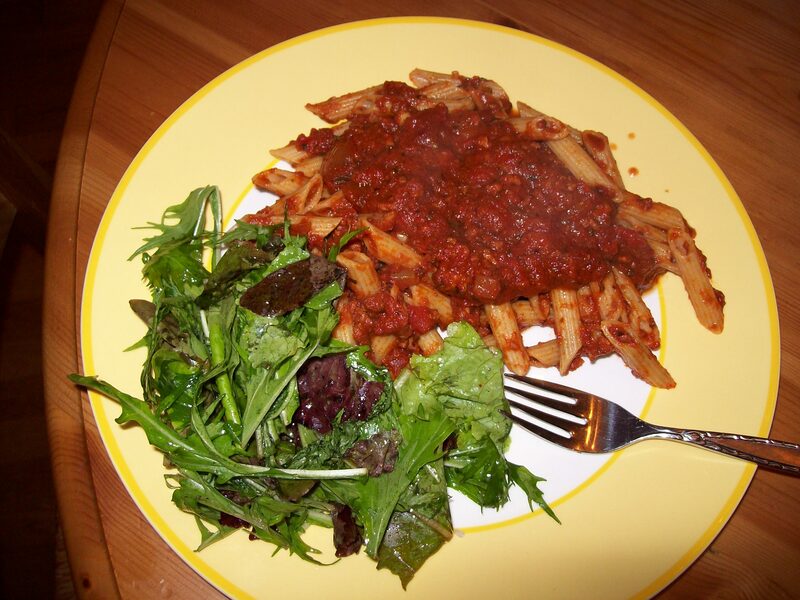 This entry was posted in Accountability, Cooking, Feeding kids, Meal planning, Parenting and tagged baking, cooking, family, Farmer's Markets, feeding kids, food, Household organization, kids' health, meal planning, muffins, parenting, recipes. Bookmark the permalink.